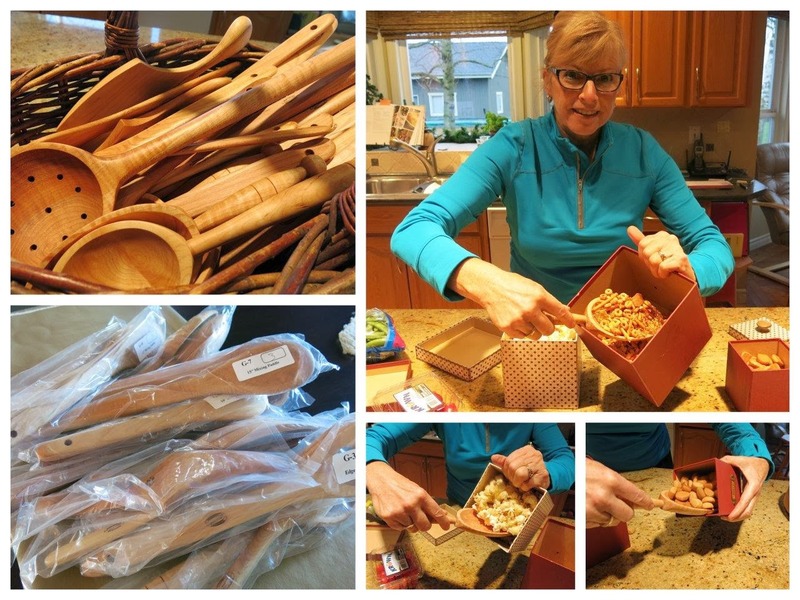 We are excited to introduce you to Whetstone Woodenware. John is our first sponsor south of the boarder. John shared with us his story of how his wife Debbie asked him to make her a wooden spoon. He diligently met her challenge and by 1984 he realized his dream of a full time wood working business designing and constructing custom wood products. John was encouraged by an enthusiastic response from those who purchased his products made from high quality kiln dried hard maple. The hard maple tree is grown and milled in the USA; their main sources located only 10 miles from his shop. John and Debbie gifted each of us girls from MGCC with a number of his wooden products to use in our kitchens. Marg's personal favourite is his line of spatulas. She uses them everyday. Browse through his website where you will find a photo and description of each of their products. Why purchase these natural wooden utensils? They will not melt, burn, or scratch any non-stick surfaces. Most people love the feel and grip of a wooden utensil over a metal utensil. Wooden ware utensils have been used by cooks and bakers for hundreds of years, and after using our personal gifts we are sold on his products! Today after 30 years John has a full production line in their Silver Lake, Indiana facility with over 37,000 pieces. Whetstone Woodware products make a really nice gift. Thank you John and Debbie for your generous support through your ongoing donations to our Greenhouse project in the Ukraine. Our second sponsor today is the Rosedale Swing Company, located in the beautiful Fraser Valley. As I sat alone in our wooden chair beneath our massive Maple tree one sultry Sunday afternoon in early August 2011, memories flooded back of the old tree swing that used to hang from the huge moss covered branch above my head. I recalled the many sweet memories spent on the old swing my father built back in '73. The scent of fresh-cut hay and ripening corn, carried on a soft, afternoon breeze perfumed the air as I reminisced. My siblings, friends, and I had grown up on that country swing and in time our children used the same swing until the ropes were worn and the swing deteriorated. Remnants of the ropes still hang in fragments from those limbs. That frayed rope triggered a lightning bolt of inspiration: I could give this gift of swing memories to our precious grandchildren. And why stop there? We could build swings for people anywhere on this planet to experience the same pleasures generations before them enjoyed. With the support and partnership of our children we launched into our family built cottage business that same week. We never looked back but continue to swing our products forward to a new generation of swing enthusiasts. Within a few days, we began gathering information necessary to build a safe, durable, classic traditional swing. We built a workshop and so began our mission. Rosedale Swing Company was born. Our responsibility to the environment had to be top priority. We knew our first choice for wood must be the strong, durable and beautiful West Coast Cedar. Our next mission was not to use any bi-product in our ropes or wood finishes – only natural, renewable, sustainable products would be used. One summers Marg and I (Kathy) were invited by Myka to come out to their place for a visit and tour of their shop. Myka literally 'showed us the ropes' and the shop where they cut and assemble their custom made swings. Quality, professionalism and friendly service is what you are sure to find at the Rosedale Swing Company. After our tour and learning some interesting things about swings we enjoyed sitting around her kitchen island together, and before we left she gifted us each a Rosedale Swing Company toto bag and cedar sachet. Personalized engraving makes each swing so special., and they ship around the world. If you are looking for a very unique gift or something special for yourself you may have found it. Thank you for your ongoing sponsorship with MGCC. Your generous giving is going to help those who are in need. Very awesome! You MGGC are never idle; always finding new ways to give. ..so inspiring! Your sponsors are all so great!! The wooden utensils from Whetstone are beautiful. I can see why you love to use these! Also the swings are so gorgeous. I love how they appear on several pictures in your Celebrations book and the personalized engraving is brilliant! Really enjoyed reading about these sponsors Marg!